(CNN) -- Emblazoned on a long, tall, concrete barrier in the midst of a rocky Middle Eastern landscape is this spray-painted message: "Mirror, mirror on the wall. When will this senseless object fall?" Messages of peace, marriage proposals and jokes are among the most popular graffiti requests. It's one of more than 900 graffiti messages that have been spray-painted by Palestinians on the controversial wall that separates Israel and the West Bank. The painters take orders through a Web site that lets customers get a message on the wall. For the equivalent of $40, a Palestinian will spray paint the message and send three digital photos of it. Anything goes -- marriage proposals, jokes, notes to friends -- as long as it isn't extremist, hate-filled, or pornographic, said Faris Arouri, one of the founders of the site. "Trying to imagine a clear view between Palestine and Israel," one message reads. "If all humans are equal, why do they have to live separated?" says another. And another simply shouts: "Get along with each other!" "This is an alternative way to send your message to whoever you're sending it to," Arouri told CNN from Ramallah. "It is there physically and it will stay there until someone sprays over it or someone decides to demolish that wall ... Hopefully it won't stay forever, because hopefully this wall will be removed sometime soon." The Israeli government began building the barrier in 2002, about two years after renewed violence erupted in Israel, the West Bank and Gaza. In some areas, it takes the form of a tall concrete wall; in others, it is more of a fence. Israel says the barrier has been successful in preventing terrorist attacks by Palestinians. But Palestinians say it amounts to an illegal land grab of Palestinian territory because it does not match the line of Israel's border with the West Bank before the 1967 Six Day War. The barrier cuts so far into West Bank territory at some points that the West Bank settlement of Alfei Menashe and five Palestinian villages are actually now on the Israeli side of the wall. Palestinians in those villages contend they are cut off from both Israel and the West Bank because they are not allowed to travel into Israel and they must pass through military checkpoints to reach other West Bank villages. The Sendamessage Web site says other families cut off by the barrier are deprived of their livelihoods. The site describes how the wall separated a family from the hotel they owned and kept farmers away from their 500 olive trees. Israel's supreme court has twice ruled that the government must reroute sections of the barrier to avoid infringing on the lives of thousands of Palestinians. Arouri represents a Palestinian non-profit group, the Peace and Freedom Youth Forum, that works on the social and political issues facing young people in the West Bank. About two-thirds of the money raised through the site goes to the group, which uses it to pay for projects like building a playground, buying bicycles, or establishing laundry facilities for university students in Bir Zeit, near Ramallah. The group says it only works with organizations that are legal in the Palestinian territories and allowed to operate by the Israeli government. The rest of the money goes to the group's partners in the Netherlands, who maintain the Web site, accept payments, and manage the paperwork. First conceived at a Dutch-Palestinian workshop in Ramallah two years ago, the site has gone on to attract customers from around the world. There have been 910 orders so far, said Justus van Oel, a Dutch screenwriter who volunteers his time maintaining the site in the Netherlands. 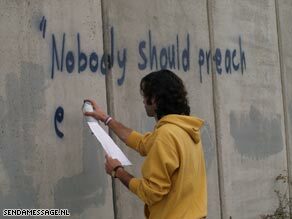 Spray-painting on the wall is a peaceful way for Palestinians to protest the barrier, Arouri said. "You're not only defying the existence of the wall, but you're also showing the international community our refusal, first of all, to such a structure," he said. "Also, it's an attempt to humanize the Palestinian society in the eyes of the world, showing that the Palestinians are not just militants who are violently resisting occupation." There are other benefits to the project, too, Arouri said. The rest of the world can get a glimpse, however small, into the Palestinians' lives behind the wall -- and the Palestinians get a sense that they're not forgotten, Arouri said. "There's no big concept," van Oel told CNN. "The wall won't fall because texts are on it, but the people behind the wall, they will have a face. It's also about beauty and poetry. It inspires people." Poetry is indeed on the wall, as are emotional pleas to take the wall down. Marriage proposals are a frequent order, Arouri said, but so are jokes and funny messages. "We had a series of obviously French (people) making silly jokes about each other, because the names were just being repeated and repeated," he said. "We also got a message supposedly from a dog, asking the neighbor's dog to come out and play in the sun." The diversity of the messages is something Arouri says he finds incredible. "We've covered most of the aspects of human life," he said. Caspar Nieuwenhuis, a Dutch theater director, used the site to propose to his girlfriend. His plan was to feature a picture of the spray-painted proposal on a Dutch news broadcast about the wall and make sure his girlfriend, a journalist, was watching -- but the picture never aired. "Then I thought, well, I have this photo of a Palestinian boy who's writing my proposal on the wall," Nieuwenhuis wrote to CNN. "I've got a notebook (computer). I could save the photo (onto) my desktop and show it to my girlfriend, just that plain and simple. "So I did. And when she saw this, she said 'yes' and cried," he said. Nieuwenhuis said he heard about the site through van Oel, a friend, and liked the idea right away. "I thought it was a brilliant idea to have something beautiful written on an ugly wall," he told CNN. The Sendamessage Foundation is also planning to spray-paint an entire letter written by South African human rights activist Farid Esack next month. It's looking for customers to sponsor a portion of the letter in exchange for having their name signed onto the end. In the letter, Esack compares the situation in the Palestinian territories to South Africa under apartheid, the Web site says.